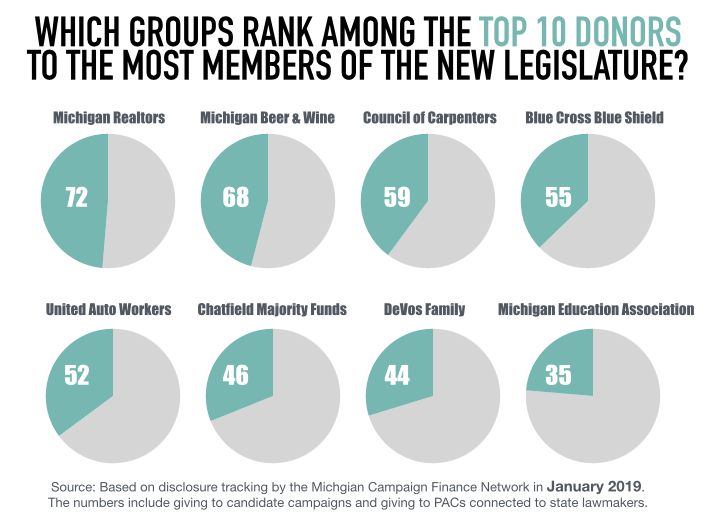 The Michigan Realtors And Michigan Beer & Wine Wholesalers Are Currently Among The Top Donors To Nearly Half Of The Members Of The New Legislature. LANSING (JAN. 15, 2019) — If giving large campaign checks to state lawmakers boosts a group’s influence in Lansing, there are some groups that stand to have a lot of power in the new legislative session. 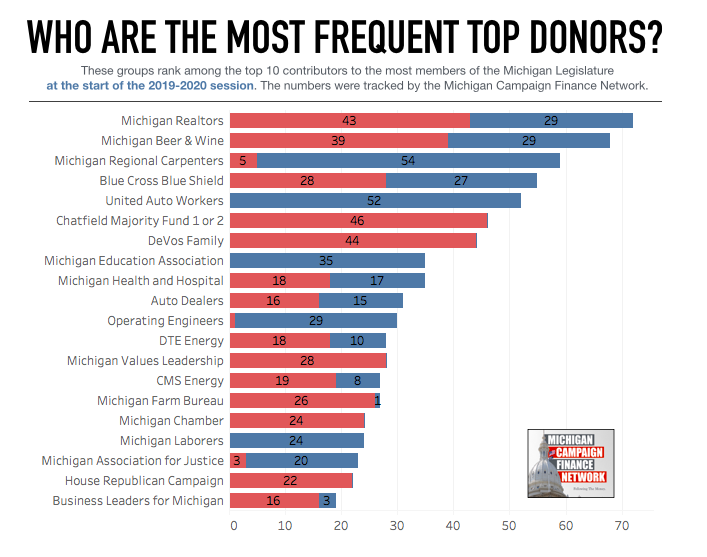 Here, at the Michigan Campaign Finance Network, we maintain a donor-tracking page that monitors the top contributors to state lawmakers across their fundraising accounts. Those accounts include candidate committees that fund lawmakers’ campaigns, leadership political action committees (PACs), which lawmakers use to support others’ campaigns, and connected organizations that can accept corporate contributions. You can access the donor-tracking information at www.mcfn.org/donor-tracking. The tracking numbers generally go back to 2011 for lawmakers who’ve served since then. For lawmakers who took office later, the tracking numbers generally begin with their most recent campaigns. We examined the tracking numbers to determine which donors ranked among the top 10 contributors to the most members of the new Legislature. We found that five groups were among the top 10 contributors to at least one-third of the 2019-2020 Michigan Legislature. The following is a breakdown of the 10 groups that show up most often on lawmakers’ top donor lists. However, keep in mind that these lists generally don’t take into account independent spending that benefits a certain lawmaker, like the spending of super PACs, and these numbers will change over time as new donations are disclosed. The numbers currently cover through Oct. 20 for donations to lawmakers’ PACs and through Nov. 26 for donations to candidate campaigns. The Michigan Realtors PAC currently ranks among the top 10 contributors for nearly 50 percent of current state lawmakers, according to MCFN's tracking. According to its website, the Michigan Realtors “is an integrated advocacy and communications force” for real estate professionals. The Michigan Beer & Wine Wholesalers Association has one of the busiest PACs in the state. According to its website, the group serves “as the trade association representing dozens of these family owned distributors and many other industry partners in communities throughout the Lower and Upper Peninsulas.” It frequently weighs in on policy proposals related to alcohol. As it stands, Blue Cross Blue Shield has been a top-10 donor for nearly the same amount of Republicans and Democrats. The company is the largest health insurer in the state of Michigan. The UAW PAC ranks among the top donors for 52 of the 68 Democrats in the Legislature. The only group that’s currently a top donor to more Democratic lawmakers is the Michigan Regional Council of Carpenters. Newly-elected House Speaker Lee Chatfield’s leadership PACs rank among the top donors to 46 of the 80 Republicans currently in the Legislature. His PACs’ top contributors over the last two years include the Republican State Leadership Committee ($130,000), Ron Weiser, Michigan GOP chairman ($50,000) and members of the DeVos family ($50,000). Members of the DeVos family, who often give their contributions on the same day in the same amounts, combine to rank among the top 10 donors to 44 Republican state lawmakers. The only contributors that rank among the top donors to more Republicans are Chatfield’s PACs. In the two years before the 2016 election, the DeVos family was the top family of donors in Michigan, according to MCFN's tracking. Similar to Blue Cross Blue Shield, the Health & Hospital Association’s Health PAC contributes to lawmakers on both sides of the aisle. According to its website, the association “represents the interests of its member hospitals and health systems in both the legislative and regulatory arenas.” The association has been a key player in policy fights over auto insurance. The Auto Dealers of Michigan PAC also contributes to candidates across party lines. In 2016, MCFN found w88 dashboardthat the Auto Dealers PAC had contributed to all but two of the members of the Legislature serving at that time.